Capital Reach’s Webcasting Sponsorship Program brings associations an all-in-one webcasting solution, including technology, on-site support and sponsors. This program lets the content pay for itself; eliminating the sometimes difficult task of justifying and budgeting for webcasting. More importantly, webcasting will become a new source for non-dues revenue. The content presented at meetings, conferences and seminars is highly valuable. Webcasting extends this content into an enduring asset for useful weeks, months, and sometimes years after the meeting ends. In the past, many associations had been unable to capitalize on this value and were forced to scale back the number of webcast sessions due to insufficient funding. Association managers, who focused on content development for their members, found challenges winning annual budget funds for a larger webcast program or failed to convince the internal sponsor sales team to sell something new for a meeting. Now, there is no longer a reason to scale back the scope or delay webcasting of meeting content. 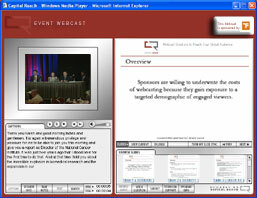 Sponsors are willing to underwrite the costs of webcasting because they gain exposure to a targeted demographic of engaged viewers. Capital Reach’s reporting package provides the metrics repeat sponsors demand. The reports display aggregate and detailed data on viewing activity, including duration data showing how long each viewer watched or listened. In a recent sponsorship success story, a Capital Reach client provided access to 90 presentations from their conference thanks to the support from a valued sponsor. Capital Reach’s reporting tracked over 10,000 unique webcast viewers with an average viewing duration of over 10 minutes. Just two months into the year-long hosting period, this is great targeted exposure for the sponsor. With success stories like this, webcasting presents a unique marketplace for sponsorship dollars. While a webcast does not replace the value of attending a conference, it does allow conference sponsors to extend brand awareness beyond the physical meeting at the same time providing a valuable new resource for association members. Capital Reach and our sponsorship-sales partner meet with the association to assess the funding potential for the content based on the meeting program and profile of association members. We are sensitive to each association’s requirements for how sponsorship is sold and implemented around their content. Once a full assessment is made, Capital Reach presents the association a matrix to outline the numbers of sessions that could be funded including the resulting association revenue. After finalizing the number of sessions, Capital Reach manages the entire webcast project from locking in a sponsor to final integration with the association’s website.